First, I have to declare an interest. Geraldine Plunkett Dillon was my grandmother. I grew up a few houses away from her; I knew her well as a child, but we grew more distant as she and I got older. I was always, however, aware of her. Nor can I claim any special knowledge of twentieth-century Irish history; the history I do is African, and while comparative methods remain fashionable, there is a limit to their elasticity. Geraldine’s husband Tommy Dillon, however, was a professor of chemistry and occasional bomb-maker. He knew that apparently incongruous elements could be mixed to produce an unexpected effect or, perhaps, a squib. This is a memoir rather than a history, and an unusual one in that it has been produced twenty years after the author’s death. Unusually also, it was not written as a unitary text; rather it has been edited together out of various notebooks written in a style suitable for publication but not necessarily in the expectation that this would happen, a series of long articles written for the University Review in the 1960s that have the formality of Irish history-writing of the time, as well as newspaper pieces, radio interviews and personal recollections. 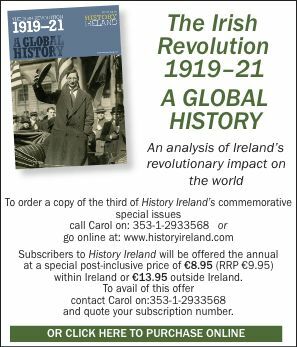 Thus there is a marked difference of tone between her far-from-carefree reminiscences of her childhood and early adulthood and her detailed narrative account of the principal public events in the memoir, the 1916 Rising, of which her brother Joe was the military organiser. There are three easily identifiable strands to this book: the personal life of a woman growing up in Ireland at the end of the nineteenth century and through the first part of the twentieth; the rise of a Catholic middle-class family in Ireland from being leather-importers and manufacturers and retailers to, through marriage, being builders of quite large parts of the wealthier suburbs of Dublin and landlords on a reasonable scale in their own right; and the move of such a family from a soft Parnellite position to a leading position in advanced nationalism. The early part of the book is taken up with descriptions of the building of the area between Donnybrook and Rathmines. This Geraldine can only have known at second hand, and there is insufficient detail to make it valuable as business history, but it does make the point that houses as a source of fascination and a topic of conversation precede the recent astronomical rise in prices. A lot of money was made, however, and a union between two increasingly prosperous Catholic families could be celebrated when the Plunketts married the Crannies and the groom, George Plunkett, independently wealthy, could pursue his interests in books, art, religious orders and the acquisition of a papal title, thus becoming one of the leading official Catholics in the city of Dublin. Meanwhile, his wife Mary Josephine could style herself countess and set about running the estate and rearing a family. The memoir makes clear that what barriers there were to Catholics rising in business in the nineteenth century could be overcome, at least to a point. They could never hope to break into the new opportunities offered by the rise of British metropolitan capitalism and the expansion of the empire. That hierarchy was determined by land, finance, religion and schooling, while manufacturing remained, as it still is, the poor relation. Catholic Ireland would always be deemed deficient on all counts. This paralleled the advances they could make in politics: they could go so far and no further, and George Plunkett stood regularly in a futile constituency for the Irish Parliamentary Party while pursuing his interest in Italian art and letters. Geraldine was born in 1891 into a world of some privilege but little happiness, and she came to blame her mother for all her and her siblings’ woes as they moved between houses in Fitzwilliam Street, Kilternan, and later Marlborough Road and a twelve-acre business in Kimmage. Certainly, by today’s standards, the childcare would be found wanting, and her mother would seem to have resorted regularly to the casual violence that was a feature of disciplinary enforcement in many homes both then and since. At points, the memoir takes on the atmosphere of St Trinian’s, as youngsters devised ways of asserting themselves against an incorrigible authority. A harbinger of things to come is the glee expressed by a young girl in the expertise gained in the use of dynamite to remove tree stumps from a lawn. Expressions of Geraldine’s hatred for her mother recur throughout much of the book and reveal two sides of her: that she could be very funny (a description of her brother-in-law: ‘He had a pass degree in Arts and did a course in bookkeeping and then blamed me for his not having a job in the English diplomatic service which he had never applied for, nor anything else either. He should have been in a bank.’) but also that she could be cruel. Her mother may be found wanting as a carer, but both women were very strong-willed, though Geraldine was the more intelligent and certainly found, ultimately, a much greater sense of direction for her energies. And the countess was right about one thing: her children were somewhat more rebellious than usual. A contemporary comparison might make the point. Even the most liberal and tolerant denizen of Donnybrook coming home today to find the hall full of rifles and boxes of ammunition, and the place in the country being used as a firing range by men brought over from Liverpool and Glasgow intent on bringing down the state, might exhibit a certain froideur at the dinner table. The relationship between Geraldine and her mother does impinge on this book as a source for women’s history. There is no place for the usual intra-generational solidarities and aspirations between mother and daughter that might help to make sense of the changing role of women in Ireland over the years. Her mother is delighted when Geraldine decides to study medicine, but it is impossible to say whether this comes from relief at her daughter’s finding an occupation or a sense that women might now be able to come somewhat more into their own. Rather this book might more usefully serve as a background to why a number of women, notable among them Geraldine’s daughter Eilis Dillon, sought to create a specifically Irish, and idealised, image of childhood in their writing for children. Geraldine’s personal assessment of her mother as high-handed, capricious, vain, inefficient, unresponsive, unreliable, brutal and flabby crystallised in her political assessment of British administration in Ireland as it develops during the Lockout of 1913 and the third Home Rule Bill crisis. Her outlook is also informed by her brother Joe’s growing involvement in the IRB to the point where he is a senior member of the executive working with the Germans against Britain during the First World War. This story is well enough known that it doesn’t need going over here, though this account does contain an intimate portrait of Joe Plunkett and an unusually detailed description of events on O’Connell Street on Easter Monday, which she saw at first hand, as well as the human consequences for those involved. It is worth saying that the degree to which the Plunketts were prepared to put everything they had on the line in the service of a fuller measure of independence for Ireland was unusual. In the aftermath of the rising the countess’s misgivings that her children would be the ruin of them all may have seemed to have come to pass, as one of her sons lay executed, two more sentenced to death, herself and her husband locked up in different prisons awaiting deportation, their property ransacked by British troops, their position in the social life of the country all but destroyed. If the question is asked as to whether they were prepared to do themselves what they were prepared to ask other people to do, the answer has to be emphatically yes. But within eighteen months they were back: Count Plunkett—whom Geraldine adored—was elected Independent MP for North Roscommon on an abstentionist platform, often credited as the first Sinn Féin victory before the 1918 flood. In fact, he was not a member of Sinn Féin and had little sympathy for Griffith or his programme. Geraldine believes that, even as early as this, the lines of conflict in the Civil War were being laid down. His election did propel the count into the forefront of high politics, a role for which he was ill suited by age, intellectual outlook and perhaps temperament. On December 1921, when news came through to Éamon de Valera that the treaty had been signed, he was attending, along with a great many of what passes for the great and the good, as well as ordinary citizens, a celebration in the Mansion House of 600 years of the poet Dante, organised by the count. There are details here that are not generally known. There is also, for people interested in language, a vernacular that is educated but not derivative; it is drawn from things around her, sayings, attitudes, common sense, observation, totally devoid of cliché, the English language of an older Ireland. It has a much wider repertoire than much public utterance today. On Easter Sunday 1916 Geraldine married her husband, Tommy Dillon, who in 1919, on his release from Gloucester Prison, was appointed professor of chemistry in University College Galway; they moved to the city and it was there that she saw out much of the War of Independence. Her account is of a badly organised Volunteer movement resisting both systematic and casual barbarity by British forces; even here she is not indiscriminate, acknowledging individual acts of kindness and bravery by particular soldiers and policemen. She was strong-minded, but not a bigot in this or other matters, and as such stands in contrast to some of the dominant stereotypes. After the agony of the Civil War, which she only touches on, it would be comforting to say that she settled into a life in Galway where she could say goodbye to all that as her husband built up a chemistry department and she built up a cultural life. It wasn’t quite to be. In the 1920s she lost a child to tuberculosis, and three of her siblings died prematurely, one in an accident, two of illness. Her other brother and sister were left permanently mentally scarred, one after coming off hunger strike in 1940. That should have been an end of it, but it wasn’t. Fifty years after many of the principal events described here, and when she was well into her seventies, I watched a march by the Dublin Housing Action Committee in support of the jailed squatter Denis Dennehy being batoned off O’Connell Bridge. Two years later there was a march on Collins Barracks demanding guns so that they could be sent north as Belfast burned. It wasn’t over by a long shot. If history was repeating itself, it was doing so as tragedy and it was Larkin—not the Manchester Martyr or Big Jim, but Philip—who was providing the most acute analysis of the internal dynamics of family life. Eoin Dillon is researching civil society in East Africa at the Centre for Development Studies, University College Dublin.